I really needed to do something with the few bananas that were left sitting on the counter. There was a recipe sitting in a pile for a bit that I had wanted to try, no time like the present. This recipe was simple to mix together and baked up in no time flat. 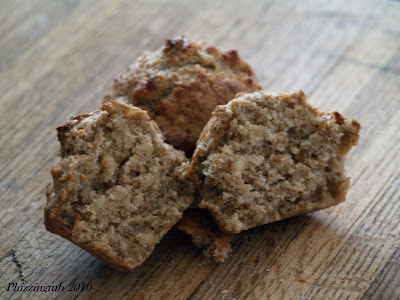 These muffins have a nice nutty taste which I think is even further enhanced by the wheat germ and are moist. 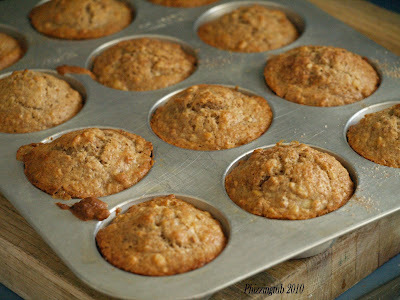 Majority of these muffins will be frozen for a quick go to for breakfasts for me. 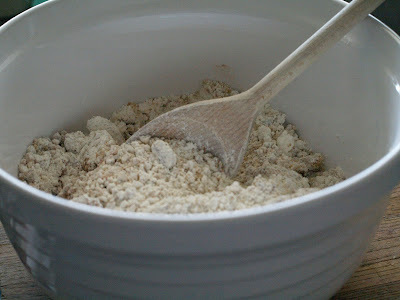 Mix flour, walnuts, wheat germ, brown sugar, baking powder, cinnamon, salt and nutmeg in large bowl. Stir in bananas, milk, butter and egg. Mix just until blended. Fill muffin cups evenly with batter. Sprinkle with cinnamon sugar, if desired. Bake muffins until a skewer inserted into centers comes out clean, 20-22 minutes. Cool 1 minute, then remove from the muffin pan and cool on a wire rack. "Easy to Bake - card"
Per Serving: 179 Calories; 9g Fat (45.0% calories from fat); 5g Protein; 20g Carbohydrate; 2g Dietary Fiber; 25mg Cholesterol; 207mg Sodium. Exchanges: 1 Grain(Starch); 1/2 Lean Meat; 0 Fruit; 0 Non-Fat Milk; 1 1/2 Fat; 1/2 Other Carbohydrates. * I did not use liners, simply sprayed each cup wiht cooking spray.